Hello Spring! 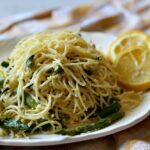 This Angel Hair Pasta with Asparagus and Lemon Cream Sauce is simple and packed with amazing flavor. A wonderful way to enjoy your favorite spring ingredients. And with an effortless lemon cream sauce that’s made with eggs and milk, this is a luscious, yet simple, Spring dinner recipe. It’s getting late, and you still don’t know what to make for dinner? Grab that package of angel hair pasta from the pantry and a batch of asparagus from the crisper drawer and in a jiff, you’ve got a glorious Spring dinner. And surely, if you’re like me, once those spears make an appearance in the markets this time of year, and the prices come down, you buy, buy, buy and always welcome a new recipe idea to use them. If I’ve said it once, I’ve said it a hundred times, angel hair pasta is underrated. And maybe that’s because I prefer lighter sauces for pasta, which are a perfect match for angel hair. A simple olive oil and garlic combination or even a thin tomato sauce is a great partner for these thin strands of pasta. A lighter sauce simply means the pasta doesn’t get lost in the sauce. And with thinner pastas, an oil based sauce helps to keep it from sticking together. Angel hair pasta cooks quickly, so watch it closely. When it’s overcooked, that’s where it gets its bad reputation for becoming sticky. The sauce for this recipe stays light with the addition of three tablespoons of lemon juice and 3/4 cup of milk. 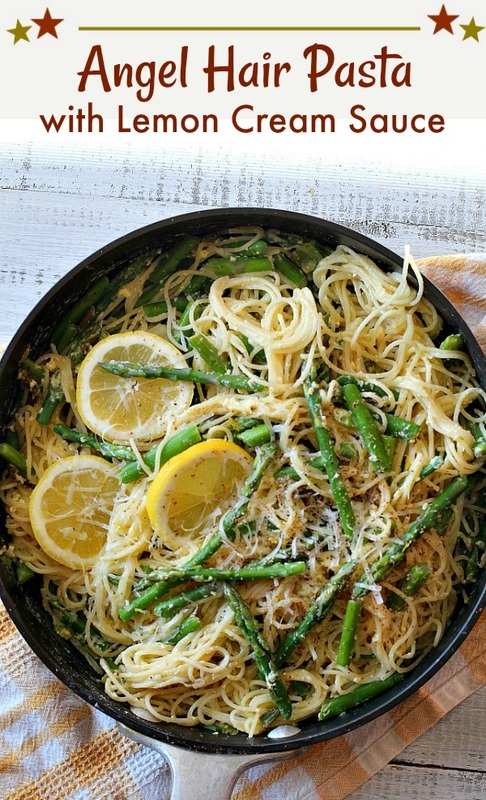 The addition of two eggs brings it all together for a light lemon cream sauce that showcases the angel hair pasta and the asparagus. And speaking of overcooking, be watchful when cooking this sauce. You don’t want the sauce to boil or you’ll have scrambled eggs. Only warm the sauce until thickened. Gather all ingredients. Slice the onions, slice the asparagus, zest the lemon, juice the lemon, measure the milk and eggs and place them in a bowl. I recommend purchasing American Beauty Pasta. Being a wheat farmer, I like to support American Beauty because they use only wheat purchased from American farmers. Boil the water for the pasta. When it comes to a rolling boil, generously salt the water before adding the pasta. Boil the asparagus with the pasta. With just two minutes left in the pasta cooking time, add the sliced asparagus. This cuts down on the number of pans and the time it takes to cook two different ingredients. Once the pasta and asparagus are cooked, before draining, reserve about 1/2 cup of that starchy pasta water. I always add some of it with my final stir before serving. It helps with the texture of the pasta and the sauce, making them even that more creamier. Reserve some fresh lemon slices for garnish and a lemony presentation. And speaking of presentation there’s always something special about serving pasta in pasta bowls. I like white and shallow. Amazon has a great selection if you’re in the mood to browse. I’ve included an affiliate link for your convenience. I am a participant in the Amazon Services LLC Associates Program, an affiliate advertising program designed to provide a means for us to earn fees by linking to Amazon.com and affiliated sites, at no additional charge to you. This recipe is simple, light and beautiful choice for your first warm weather dinner on the patio. I hope you give this one a try and if you do, please come back and let me know how you liked it and give the recipe a star rating. Your feedback is valuable to me for developing future recipes. In a large sauce pan, such as a Dutch oven, cook pasta in boiling water 4 minutes. Add asparagus; cook 2 minutes or until tender. Drain. While the pasta cooks, melt butter in a large skillet over medium heat. Add onions and lemon zest; sauté 1 minute. Add juice; cook 1 minute or until liquid almost evaporates. Combine milk and eggs in a small bowl; stir well with a whisk. Add pasta mixture and milk mixture to skillet; stir well. Cook over low heat 3 minutes or until milk mixture is slightly thick, stirring constantly (do not boil). Stir in dill, salt, and nutmeg. Serve immediately. Looks really good and we’re hoping our new asparagus does well this year. 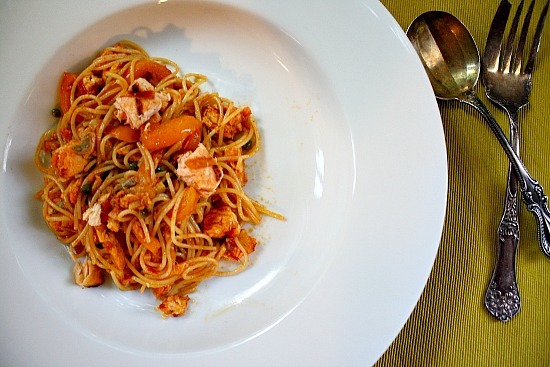 My next post is one of your pasta dishes. Perfect dish — loaded with flavor and easy. And most of it can be made with pantry staples! Perfect weeknight fare. Thanks! Made this last night. Love adding tempered eggs to thicken the sauce. It was a delicious spring dish! This pasta recipe is a perfect epitome for spring! 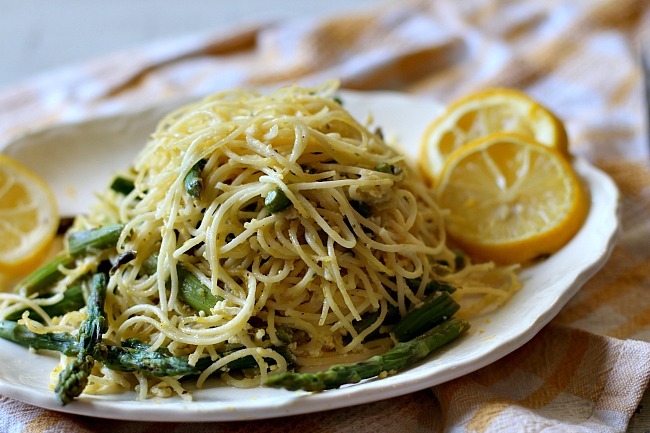 The zest of lemon with asparagus and cheese is just the right blend for brunch or dinner! Thanks for the recipe,Lea! chicken strips but definitely didn’t need it.